Somboon Saraphanh, Owner and Chef of Thai Orchid since 1999 was born and raised in Ubon Ratchathani, Thailand. Since age 10 Somboon watched and learned from her mother, aunts and grandparents the culinary skills and recipes she still uses today. Inspired by the “American Dream” she moved with her family to California in 1979 in hopes for a brighter future for her four children. Working 13 hour shifts, 6 days a week for minimum wage Somboon still managed to prepare and cook both lunch and dinner for her family every day. In 1994, she and her husband, Ou, vacationed in Anchorage, Alaska just to visit family and friends. But they immediately fell in love with the state and knew it to be their new home. So Somboon did what she knew best. 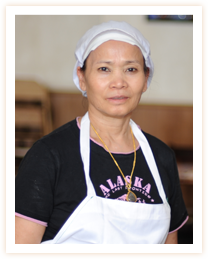 She used her favorite family tradition that makes Thai Orchid restaurant so successful: cooking from the heart. "The food is great! I get the same thing most of the time I go there: Garlic Chicken, Peanut sauce and Spring rolls. Once you go there often and are friendly the waiters get to know you and always are helpful. Its small but so what their food is the best Thai in town..."
"I have been coming to Thai Orchid for the past 3 years and I have not had a bad meal there. I get take out since their small restaurant is always busy and who can blame them since the food is beyond fantastic, it's just like the way my mum would have made it herself..."
"I love Thai Orchid! The place is small but like the other reviews said, it is so worth the wait. They are closed at various times of the year for a couple weeks at a time which is rough because you CRAVE their food. Try it! I am sure you will love it as much as my husband and I do. Good portions and prices. I suggest bringing a few friends and sharing so you can try many things."